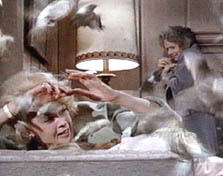 Alfred Hitchcock's The Birds was based on a short story by Daphne Du Maurier, who had also written Jamaica Inn and Rebecca. The challenge for Hitch was to flesh out the simple story into a full-fledged script. Inspired by a 1961 true newspaper account, the film involved nature gone awry and appealed to Hitchcock because the birds that attack humans are not birds of prey...but rather, an assortment of ordinary, everyday feathered friends. The films from the Master of Suspense had consistently strived to expose the terror that lurked in the commonplace. With Hitchcock (as with the best of Shakespeare's work) nothing is as it seems...and in the banal, we often find the worst horrors. For The Birds, he hired novelist Evan Hunter to write the story and changed the setting from England to an area outside of San Francisco. 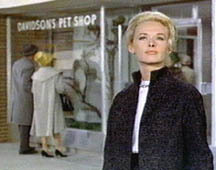 He cast former model Tippi Hedren in the lead role and employed then state-of-the-art special effects. 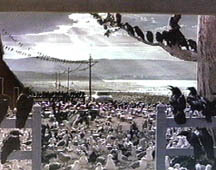 Essentially employing thousands of real trained birds intermixed with fakes, Hitchcock was able to create the illusion of a mass attack on the quiet community of Bodega Bay. 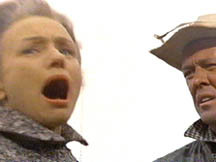 The result was a box office smash...and along with PSYCHO, remains one of Alfred Hitchcock's most famous and imitated films. Melanie Daniels (Tippi Hedren) is a carefree young woman who meets lawyer Mitch Brenner (Rod Taylor) in a San Francisco pet store. As Mitch is looking to buy a set of lovebirds, Melanie pretends to be a salesperson and delights in a variety of duplicitous double entendres and outright lies. However, Mitch is on to Melanie...having recognized her from a previous legal incident with which he was involved. Having not found the bird he wants, Mitch coyly bids Melanie adieu. The intrigued Melanie buys a pair of lovebirds later that day and, like a bird in chase, she drives to his home in Bodega Bay 60 miles north. She intends on delivering the set of lovebirds to his younger sister Cathy (Veronica Cartwright) and plans to pursue Mitch as well. Once in Bodega Bay, she inquires about the Brenner residence at a local store. Rather than take the paved road to his home, she decides to cross the bay instead via boat - in order to surprise him. 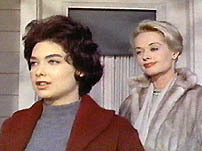 Melanie also meets local schoolteacher Annie (Suzanne Pleshette), Mitch's former flame. Eyeing each other like ravenous birds prepared to fight, Melanie manages to get the name Mitch's sister and is able to prepare a note with her gift. Dropping off her surprise, a satisfied (and spotted) Melanie quickly crosses the bay back to her car. 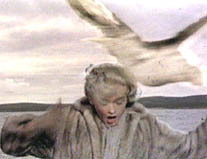 On her return trip, a seagull swoops down and strikes her on the head. 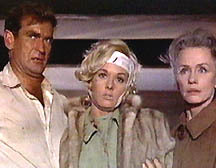 She is not seriously injured but the alarming incident is enough to prolong her rather presumptious (if not downright damn pushy) visit; she is invited to dine with Mitch and his mother Lydia (Jessica Tandy) with whom he lives. Curiously enough, Lydia's chickens are not eating their feed...a strange sign. Lydia discovers that evening from the feed seller that a local farmer's chickens are also not eating...even though the farmer was sold a different brand of feed. Meanwhile, having been befriended by young Cathy (we'll say Cathy was bribed), Melanie is invited to Cathy's birthday party the next day...to be held outdoors. While spending the night at Annie's place, Melanie and Annie discuss Mitch, the recent death of his father...and his cold, distant mother Lydia. Suddenly, a loud thwack on Annie's front door interrupts their chat; at the door, they discover a huge dead seagull who has rammed into the front door head-on. Annie muses that perhaps the poor thing couldn't see in the dark night. But it's a full moon, Melanie observes. The next day at Cathy's outdoor birthday party, seagulls attack the children. Perplexed and confused by the incident, Mitch thinks Melanie should stay for dinner again. That evening, a huge swarm of birds descend through the chimney of the Brenner house. In a difficult process shot, Hitchcock manages to convey the reality of hundreds of birds within the meager confines of the Brenner living room, every type of bird represented here, from sparrow to parakeet. 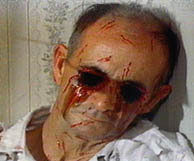 She discovers Dan's bloody body with his eyes gouged out. In a wonderfully exploitative moment, Hitch outlines this moment with a dastardly triple take: first a long shot of Dan's bloodied face, then a medium shot pulling in - and closing with a horrific close up of Dan's missing eyes. In silent, screaming terror, Lydia exits Dan's house. At the Brenner home, Lydia tries to calm herself but decides she is not strong enough. After the recent death of her husband, she confides to Melanie that she feels more and more alone. Coupled with the strange bird attacks and their increasing violence, Lydia is on the verge of collapse. Melanie alleviates Lydia's concerns by promising to check in on Cathy at school. Arriving at the schoolhouse, Melanie waits for Annie to dismiss her class...as an ominous crowd of black crows gather on the jungle gym. Fleeing the school, Melanie, Annie and her students are attacked as they race towards town. Many of the children are injured. Finding refuge in the local inn, Melanie, Mitch and some of the locals ponder what to do next. Soon, the birds pound the downtown Bodega area, causing a huge gas station fire. Panic ensues and more people are killed. Trying to make their way back to the Brenner homestead, Mitch finds Cathy back at Annie's place, frightened beyond belief. The birds have claimed Annie outside on her porch. Mitch secures Annie's bloodied body inside and takes both Cathy and Melanie back to his place. After boarding up the house, the group become virtual prisoners. As day becomes night, Mitch must defend the clan against birds coming down the fireplace, through the garage door, etc. Finally, the tumult outside subsides and the weary family relaxes. Hearing a noise upstairs, Melanie investigates and finds herself in the attic...where a hole in the roof has allowed the birds inside the room. Trapped, she is brutally assaulted. Rescuing Melanie just before death, Mitch carries her back to safety. He decides they must get Melanie to a doctor, and to do this, they must flee to San Francisco. The frightened group decide to take Melanie's convertible (a ragtop, naturally) since it will be quicker than the Brenner pickup truck. During a lull in the attacks, Mitch, Melanie, Lydia and Cathy walk out to Melanie's car and slowly drive away. The car travels through a multitude of waiting birds, who allow them to leave. It is a bleak ending...and Hitchcock refused to allow the words "The End" to appear - since there is no conclusion. Incidentally, a longer ending was planned in production but never filmed. In this alternate ending, the now victorious birds of Bodega Bay are much less tame. They pursue the Brenners down the local road out of town, clawing their way through Melanie's ragtop convertible...only to have the Brenners escape with their lives. In typical Hitchcock fashion, there are enormous amounts of symbolism and layers to the movie...so this one can be viewed both as a straightforward thriller and also as a multiple-viewing discussion movie. There is a psychological terror about The Birds that elevates it above the average "when animals attack" kind of picture. The pressure and fear is there...even in quiet unassuming moments. One is always struck by the feeling of relentless horror that the characters endure. Hitchcock was pure genius and his ability to tap into our subconciousness is unparalleled.